Man, Planet Fitness is VERY busy on a Monday at noon. Of course a solid 80% of the people in there are retired and utilize mostly cardio machines and oddball weight machines I never touch. I am hoping once we get out of season a lot of these snowbirds will flock to other areas of the country. I did a push pull kind of thing today. 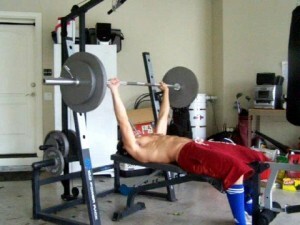 I had a Bulgarian named Martin spot me on what was supposed to be a single rep at 220lbs on the bench press. Unfortunately he had his hands on the bar the entire time meaning it didn’t count at all, in my mind. The highlight was “full stacking” the Cybex mid-row machine which required pulling 210lbs. Cindy and I got a solid cardio workout in yesterday with our road bikes. We put in 20 miles at an average pace of 18.6 mph, not bad.